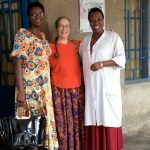 Canadian Friends Service Committee has partnered with Friends Women’s Association (FWA) in Burundi for several years to help them deliver HIV testing and patient care, as well as work to counter gender-based violence. 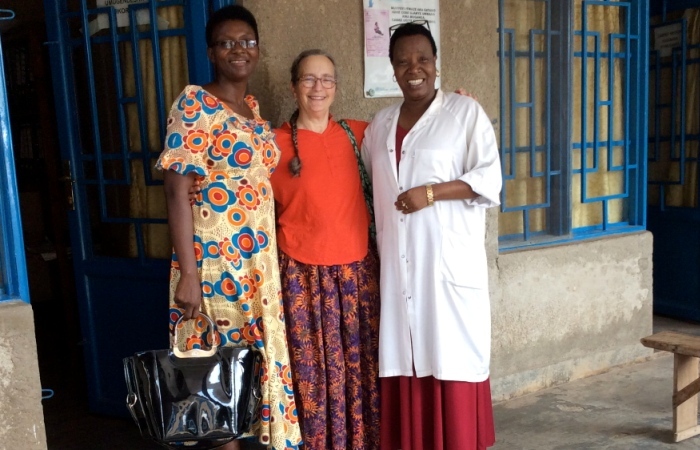 CFSC board member Bertha Small visited FWA in June and had this to report. I arrived in Bujumbura on 23 June, after flights from Montreal to Toronto, Toronto to Addis Ababa, and then Addis Ababa to Bujumbura. I was delighted to be met at the Bujumbura airport by Parfaite and Jocylene, who drove me to my hotel, and after checking that the room was adequate, left me to recover. The hotel was in a quiet unpaved side street just off a busy noisy main street, with an attractive mall central garden which was, alas, in seemingly constant sunlight. I discovered that a vegetarian diet is an unknown oddity here, but managed, with sometimes strange combinations and the help of an eager, French-speaking waiter, Fabius, to be well nourished. French is the second language here, but is not predictably spoken by hotel staff, and I do not speak any Kirundi. On Sunday, 24 June, I was picked up by Jocylene and driven to the service at the church where Parfaite is pastor. We arrived toward the end of an hour-long Bible question and answer session, but were present for the two-hour service. This was my first experience of a Friends’ Evangelical Church service and I did not know what to expect. It was, of course, completely different from an unprogrammed meeting for worship, with a structured service, including a long, passionate sermon from Parfaite. I was seated next to a young man who translated into English for me, and when I found out that he was an English professor, I was no longer surprised at his fluency, but startled by his apparent youth! On my return to the hotel, I was delighted to be greeted by Sylvain Obedi, a university law student from North Kivu, DRC, whom I had met when I had worked in Walikale and with whom I had kept quite close contact. He had made the effort to come to Bujumbura to meet me, no minor feat given the dangers of traveling on the road from North Kivu to South Kivu, necessary to cross over into Burundi, not to speak of the fact that he is handicapped and ambulates with difficulty on crutches. We spent many hours talking in the hotel patio/restaurant and when it was time to ask for supper, Sylvain was surprised and frustrated that there was no one there (Fabius was off) who spoke either French or Swahili. I coped by pointing to what I thought I could eat! On Monday, 25 June, Parfaite picked me up to take me to the Friends’ Women’s Association clinic. There was a detour due to some military operation that took Parfaite onto roads she did not know, but eventually we got back on the main road. The clinic is in Kamenge, a very poor Hutu area of Bujumbura, and an area that was razed during the civil war in the early 2000’s. It is also the location of Parfaite’s first church, and she showed me later the impressive church structure that she was instrumental in fund-raising for. The clinic provides health care for HIV+ patients, but also others in the community needing care. There is no problem of supply for antiretroviral medications for HIV, as these are provided through the government by international charitable organizations, but there is a serious lack of other medications, such as those needed for the secondary infections that often afflict HIV+ people. I was able to hand over some medical supplies that I had brought from Canada, which were on their “wish list”. I sat in on portions of two meetings of microlending groups, one specific to HIV+ women, the other not. It was explained that all the members of the group contribute a small amount to the ‘pot’, and each month, one member is selected to receive an amount for ‘petit commerce’ (such as reselling foodstuffs or selling some handicraft), and at the end of the month she is expected to pay back the amount given plus 10%. If she is not able, and has a good explanation, she may be given a second month, but then must pay 20% extra. If she takes off with the amount she was given, she forfeits her contribution to the ‘pot’. At the end of the year, the pot plus all the interest paid is divided amongst all the members. This is a new enterprise of FWA, and they started a year ago with just a couple of groups, but have now expanded in response to demand for more groups. I also attended a ‘groupe de parole’ for HIV+ patients, which included mostly women but also 3 men, and a few toddlers with their mothers. The topic of the day, in the discussion led by one of the FWA nurses, was family planning, which I gather is gaining in interest despite the opposition of the Catholic church, which is by far the majority faith in Burundi. While promoting condoms, and depo-provera injections, the nurse also showed a ‘birth control necklace’ which is a tangible way of counting the days with the notoriously unreliable ‘calendar method’, but I realized how basic the teaching needs to be when one of the women asked if the beads on the necklace were for swallowing. There was also discussion about the need to take ARVs regularly every day. As they are not supposed to be taken on an empty stomach, they are often skipped when the patient has nothing to eat. One member of the group was cited as an example when she mixed ash and salt to take her pills with when she had nothing to eat!! There does not seem to be any ecumenical cooperation in the attempt to provide support for HIV and other destitute patients, but all are welcome, and it was pointed out to me that some of the members of the HIV+ micro-lending group were Muslim. On Tuesday 26 June, I went with Parfaite to a drop-in HIV testing site at the local market, which FWA runs monthly. It was a small cloth shelter, packed with people, and with a tiny space curtained off at the back for the confidential pre-test counseling and for testing. I gathered that while women will come to the clinic for testing, men tend to prefer coming to the market site, which is more anonymous. Apparently only 50% of those testing positive then come to get treatment, for others rely on various magical remedies, or perhaps do not believe the testing. On our way to the market, Parfaite had stopped at the Interior Ministry building, to try, yet again, to get permission for me to be allowed into the countryside on Friday to witness their gender-based violence workshops. Her previous attempts were not successful, and this time she was told by the person she met that giving such permission exceeded his authority, and that there was a one month wait to see his superior! Parfaite said she will try again tomorrow. I spent quite a while chatting with Dr. Alexia, one of the two women doctors volunteering to work at the FWA clinic. She raised her many siblings, and married a Quaker pastor. They are not able to have children of their own, but she has an adopted son, and has just adopted an abandoned baby at the hospital where she works, and seems to also run a rooming house for many members of her extended family who come to Bujumbura for education. On Wednesday 27 June, Parfaite collected me midday, after spending the morning again at the Interior Ministry and finally being told that if she came back tomorrow, they would probably have the necessary paper work! At the clinic, I was able to meet the board of directors of the FWA as well as two of the founding members. From them, I learned that FWA had started to support the HIV+ wife of a Quaker pastor, and then expanded to care for HIV+ members of the church community, and then to care for HIV+ members of the local community at large. It was eventually recognized that violence was a significant factor in the spread of HIV, and that women who were completely dependent financially on their partners were at particular risk, which prompted the start of the micro-lending groups, and the effort at public education about gender-based violence. I was happy to give the little gifts I had brought for the board members and the conseil d’administration, and they most kindly gave me a pagne dress. After I returned to the hotel, I was told that someone was waiting for me, and came out to find Leon and Assumani, the fellows from Uvira (South Kivu) who were coming with me to Kinshasa for the AVP training. We had an enjoyable supper together while I e-mailed Matt urgently to try to arrange for Assumani’s transportation (lacking a passport, he could not travel with Leon and me via Addis Ababa). I gave Assumani the funds he needed to get to Goma for his internal flight to Kinshasa, and arranged to meet Leon back at the hotel on Saturday morning for our lift to the airport. On Thursday 28 June, I accepted with gratitude the offer of Fabius to give me a little walking tour of the center of Bujumbura, as I would not be inclined to wander on my own, and I was not being picked up by Parfaite until mid-afternoon. We walked for a couple of hours, and I stuck close with him, remembering that the most common cause of injury and death abroad is traffic accidents! We visited some buildings full of little shops, mostly selling clothes and shoes, but with a few tailors evident. We passed the Marche Centrale which had burned down a while ago, met his older sister who works in a hole-in-the-wall bridal shop, and visited a small craft market where he was eager to buy me a memento, and I finally agreed on a little set of nesting baskets which I thought would appeal to my granddaughter. Parfaite and Jocylene took me to the ‘living museum’, a sad little zoo with a lot of large crocodiles, native to Lake Tanganyika, and which the keeper delighted in prodding into a scary response, a leopard and a couple of chimpanzees, plus some snakes, of which even the keeper seemed leary of the green mamba, saying it was truly nasty! We then went to the shore of Lake Tanganyika, and sat on the sand, enjoying the breeze and the view, with no temptation to dip toes in the crocodile infested waters. On Friday 29 June, Parfaite and I were driven into the countryside (she having finally acquired the necessary permission). It took two hours to get to Gitenga, the ‘second city’ of Burundi. It has a presidential palace, but we passed the much larger one under construction on the outskirts of Bujumbura. The road was winding and mountainous, with much blind passing accompanied with honking as warning. Everywhere there were hazards of people walking, bicycles (flying downhill, walking up), motorcycles, occasional huge holes in the road, and seriously unpleasant speed bumps in towns or by construction sites. Most large trucks had cyclists hanging on the rear, catching a ride, and some had men clinging tenuously to rear bumpers and container handles. Bicycles carried everything from layered bags of bricks, multiple wooden sofa frames, many long planks of wood, many bunches of bananas, bags of flour, and a pile of 30-40 plastic chairs! We stopped in Gitenga so that Parfaite could deposit the precious letter of permission that she had obtained after so much effort, discovering that even in the government building functioning lavatories were almost impossible to find. We then went on to a village where Grace (an educator I had met at FWA) was in her third day of a three day workshop to train local leaders about gender-based violence, so that they, in turn, could pass on the message. I met a local male Quaker pastor who is sometimes involved in these workshops, who had spoken yesterday about masculinity, and how it does not equate to violence. We then went to another village where previously trained facilitators were providing a public performance. There was traditional male drumming and dancing, but then women dancing to women drumming, and then some street theatre about GBV. The second scenario was more traditional physical violence of a husband against his wife, and when a community worker tries to intervene, he explains that he has turned to drink and to beating her because she has refused conjugal relations for years. The worker suggests that he might get better results by offering her a gift rather than attacking her, and when he does so, she is delighted and one is led to presume that peace and good will are restored. The audience were all the local elementary school children (the secondary school children had exams) and many villagers passing by or attracted by the drumming and singing. All was in Kirundi, but Parfaite provided an occasional bit of translation, and much was obvious from the miming. On Saturday 30 June, Parfaite came by the hotel to say goodbye, and Leon arrived just in time for our ride with Jocylene to the airport. We flew from Bujumbura via Goma to Addis Ababa, where to my surprise and delight we found that Ethiopian airlines put us up in a hotel since we had an overnight layover. The hotel was not near the airport, and the shuttle could accommodate only a portion of the passengers waiting, so we had a long wait in the airport parking lot, but eventually made it to the hotel, which was quite nice, apart from some dodgy plumbing. 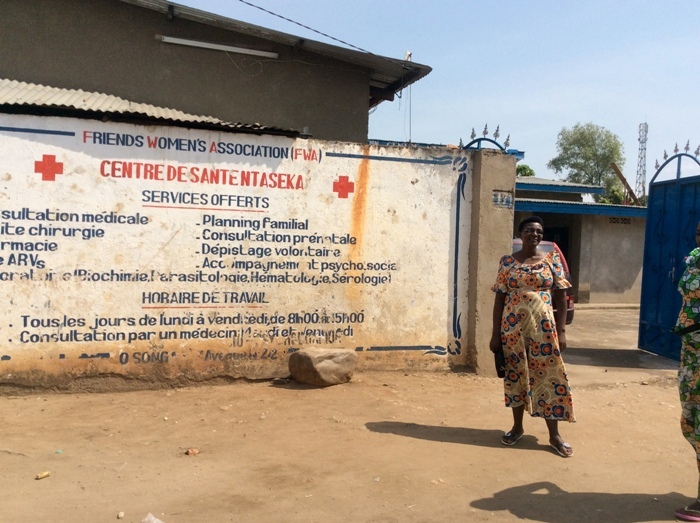 Learn more about the work CFSC supports in Burundi and DR Congo.